Introduced before emissions-based taxation the Audi A2's clever lightweight construction, efficient engines and cleverly spacious interior were lost on the marketplace. 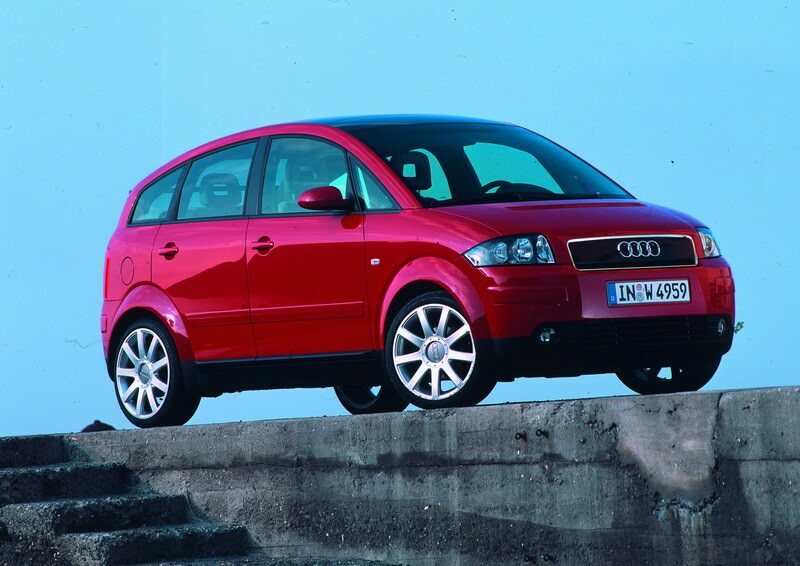 If ever a car could have been said to be ahead of its time the Audi A2 is it. Introduced before emissions-based taxation the A2's clever lightweight construction, efficient engines and cleverly spacious interior were lost in a marketplace where its relatively high price counted against it. Still feeling modern today, it's a canny used buy for those wanting an economical runabout. Launched in 2000, the Audi A2 pioneered the company's aluminium spaceframe construction, making for a lightweight supermini-sized car with some serious weight advantages. Small, efficient engines powered it, Audi offering the A2 with 1.4- and 1.6-litre petrol units, plus a three-cylinder 1.4-litre TDI turbodiesel. The 1.4-litre petrol is by far the most common, its 75hp more than enough to power it given the A2's 895kg kerb weight. For a small car there's Audi's big-car quality inside, the interior fit and finish very much in the premium camp, while space is generous too thanks to the A2's clever design. The boot is sizeable and compartmentalised thanks to the 'multibox modular system', and if you fold the seats there's as much as 1,085 litres of space on hand. That rear seat was originally only for two, though the options list offered a more conventional bench layout for a third passenger. Early Irish cars lacked some of the basics offered in other marketplaces in a bid to keep prices competitive, with things like a parcel shelf over the boot being consigned to the options list. There was no such scrimping on safety though, as anti-lock brakes (ABS) with brake assist and ESP stability control were standard on all models. Passenger space might be good, but visibility out of the rear isn't great thanks to the positioning of the rear spoiler and tint of the glass. With no real overhangs it's not too difficult to park though. The engines all give good performance, particularly at the fuel pumps; the manual gearshift is accurate, though the suspension is rather firm on poorer road surfaces. With the 1.4 petrol being the most common, in an admittedly limited number of A2s available here, it's the best choice by default, and on ability too. Prices remain strong given its relative age, but the A2's appeal will always be a safe place, in every sense of the word to put your money. The Audi A2 is a clever interpretation of a supermini with compact MPV-like space, city car-like economy and an upmarket, premium car feel inside. A car well ahead of its time, well worth considering as a used buy.